What is it that makes people so crazy about dogs? Whether it's their tail-wagging-happy personalities or noses with miraculous smell-detecting sense, dogs offer so much to keep us enthralled with their companionship. 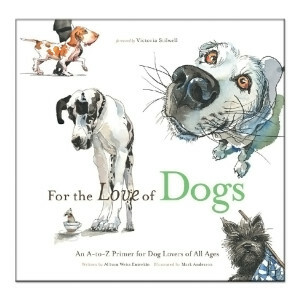 For the Love of Dogs expresses the passion we feel for our pets using all 26 letters of the alphabet accompanied by rhymes, colorful illustrations, and informative text. The result is a tribute to pooches that can be enjoyed by readers of all ages." WHICH BREED IS YOUR BEST IN SHOW? National dog magazine editor Allison Weiss Entrekin shares the pooches that are perfect for all dog lovers. From barking Beagles to dashing Dachshunds, many of our favorite breeds are featured on the colorful pages of Entrekin's new book. And because I is for ""Instincts"" and O is for ""Obedience,"" readers will learn about some of the traits that make dogs such fascinating friends. With a foreword written by Victoria, this all-new book explores our canine obsession in a fresh and humorous way. "